"al-Khwārizmī" redirects here. For other uses, see al-Khwārizmī (disambiguation). Al-Khwarizmi's popularizing treatise on algebra (The Compendious Book on Calculation by Completion and Balancing, c. 813–833 CE:171) presented the first systematic solution of linear and quadratic equations. One of his principal achievements in algebra was his demonstration of how to solve quadratic equations by completing the square, for which he provided geometric justifications. :14 Because he was the first to treat algebra as an independent discipline and introduced the methods of "reduction" and "balancing" (the transposition of subtracted terms to the other side of an equation, that is, the cancellation of like terms on opposite sides of the equation), he has been described as the father or founder of algebra. The term algebra itself comes from the title of his book (specifically the word al-jabr meaning "completion" or "rejoining"). His name gave rise to the terms algorism and algorithm. His name is also the origin of (Spanish) guarismo and of (Portuguese) algarismo, both meaning digit. In the 12th century, Latin translations of his textbook on arithmetic (Algorithmo de Numero Indorum) which codified the various Indian numerals, introduced the decimal positional number system to the Western world. The Compendious Book on Calculation by Completion and Balancing, translated into Latin by Robert of Chester in 1145, was used until the sixteenth century as the principal mathematical text-book of European universities. In addition to his best-known works, he revised Ptolemy's Geography, listing the longitudes and latitudes of various cities and localities. :9 He further produced a set of astronomical tables and wrote about calendaric works, as well as the astrolabe and the sundial. :669 He also made important contributions to trigonometry, producing accurate sine and cosine tables, and the first table of tangents. Few details of al-Khwārizmī's life are known with certainty. He was born into a Persian family and Ibn al-Nadim gives his birthplace as Khwarezm in Greater Khorasan (modern Khiva, Xorazm Region, Uzbekistan). There is no need to be an expert on the period or a philologist to see that al-Tabari's second citation should read "Muhammad ibn Mūsa al-Khwārizmī and al-Majūsi al-Qutrubbulli," and that there are two people (al-Khwārizmī and al-Majūsi al-Qutrubbulli) between whom the letter wa [Arabic 'و‎' for the conjunction 'and'] has been omitted in an early copy. This would not be worth mentioning if a series of errors concerning the personality of al-Khwārizmī, occasionally even the origins of his knowledge, had not been made. Recently, G.J. Toomer ... with naive confidence constructed an entire fantasy on the error which cannot be denied the merit of amusing the reader. Another epithet given to him by al-Ṭabarī, "al-Majūsī," would seem to indicate that he was an adherent of the old Zoroastrian religion. This would still have been possible at that time for a man of Iranian origin, but the pious preface to al-Khwārizmī's Algebra shows that he was an orthodox Muslim, so al-Ṭabarī's epithet could mean no more than that his forebears, and perhaps he in his youth, had been Zoroastrians. Ibn al-Nadīm's Kitāb al-Fihrist includes a short biography on al-Khwārizmī together with a list of the books he wrote. Al-Khwārizmī accomplished most of his work in the period between 813 and 833. After the Muslim conquest of Persia, Baghdad became the centre of scientific studies and trade, and many merchants and scientists from as far as China and India traveled to this city, as did al-Khwārizmī. He worked in Baghdad as a scholar at the House of Wisdom established by Caliph al-Ma’mūn, where he studied the sciences and mathematics, which included the translation of Greek and Sanskrit scientific manuscripts. Douglas Morton Dunlop suggests that it may have been possible that Muḥammad ibn Mūsā al-Khwārizmī was in fact the same person as Muḥammad ibn Mūsā ibn Shākir, the eldest of the three Banū Mūsā. 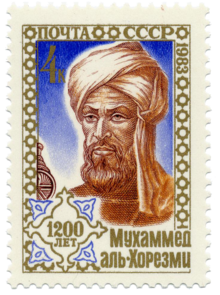 Al-Khwārizmī's contributions to mathematics, geography, astronomy, and cartography established the basis for innovation in algebra and trigonometry. His systematic approach to solving linear and quadratic equations led to algebra, a word derived from the title of his book on the subject, "The Compendious Book on Calculation by Completion and Balancing". On the Calculation with Hindu Numerals written about 820, was principally responsible for spreading the Hindu–Arabic numeral system throughout the Middle East and Europe. It was translated into Latin as Algoritmi de numero Indorum. Al-Khwārizmī, rendered as (Latin) Algoritmi, led to the term "algorithm". Al-Khwārizmī systematized and corrected Ptolemy's data for Africa and the Middle East. Another major book was Kitab surat al-ard ("The Image of the Earth"; translated as Geography), presenting the coordinates of places based on those in the Geography of Ptolemy but with improved values for the Mediterranean Sea, Asia, and Africa. He assisted a project to determine the circumference of the Earth and in making a world map for al-Ma'mun, the caliph, overseeing 70 geographers. When, in the 12th century, his works spread to Europe through Latin translations, it had a profound impact on the advance of mathematics in Europe. Left: The original Arabic print manuscript of the Book of Algebra by Al-Khwārizmī. Right: A page from The Algebra of Al-Khwarizmi by Fredrick Rosen, in English. The Compendious Book on Calculation by Completion and Balancing (Arabic: الكتاب المختصر في حساب الجبر والمقابلة‎ al-Kitāb al-mukhtaṣar fī ḥisāb al-jabr wal-muqābala) is a mathematical book written approximately 820 CE. The book was written with the encouragement of Caliph al-Ma'mun as a popular work on calculation and is replete with examples and applications to a wide range of problems in trade, surveying and legal inheritance. The term "algebra" is derived from the name of one of the basic operations with equations (al-jabr, meaning "restoration", referring to adding a number to both sides of the equation to consolidate or cancel terms) described in this book. The book was translated in Latin as Liber algebrae et almucabala by Robert of Chester (Segovia, 1145) hence "algebra", and also by Gerard of Cremona. A unique Arabic copy is kept at Oxford and was translated in 1831 by F. Rosen. A Latin translation is kept in Cambridge. It provided an exhaustive account of solving polynomial equations up to the second degree, and discussed the fundamental methods of "reduction" and "balancing", referring to the transposition of terms to the other side of an equation, that is, the cancellation of like terms on opposite sides of the equation. by dividing out the coefficient of the square and using the two operations al-jabr (Arabic: الجبر‎ "restoring" or "completion") and al-muqābala ("balancing"). Al-jabr is the process of removing negative units, roots and squares from the equation by adding the same quantity to each side. For example, x2 = 40x − 4x2 is reduced to 5x2 = 40x. Al-muqābala is the process of bringing quantities of the same type to the same side of the equation. For example, x2 + 14 = x + 5 is reduced to x2 + 9 = x. If some one says: "You divide ten into two parts: multiply the one by itself; it will be equal to the other taken eighty-one times." Computation: You say, ten less a thing, multiplied by itself, is a hundred plus a square less twenty things, and this is equal to eighty-one things. Separate the twenty things from a hundred and a square, and add them to eighty-one. It will then be a hundred plus a square, which is equal to a hundred and one roots. Halve the roots; the moiety is fifty and a half. Multiply this by itself, it is two thousand five hundred and fifty and a quarter. Subtract from this one hundred; the remainder is two thousand four hundred and fifty and a quarter. Extract the root from this; it is forty-nine and a half. Subtract this from the moiety of the roots, which is fifty and a half. There remains one, and this is one of the two parts. Several authors have also published texts under the name of Kitāb al-jabr wal-muqābala, including Abū Ḥanīfa Dīnawarī, Abū Kāmil Shujāʿ ibn Aslam, Abū Muḥammad al-‘Adlī, Abū Yūsuf al-Miṣṣīṣī, 'Abd al-Hamīd ibn Turk, Sind ibn ‘Alī, Sahl ibn Bišr, and Sharaf al-Dīn al-Ṭūsī. Perhaps one of the most significant advances made by Arabic mathematics began at this time with the work of al-Khwarizmi, namely the beginnings of algebra. It is important to understand just how significant this new idea was. It was a revolutionary move away from the Greek concept of mathematics which was essentially geometry. Algebra was a unifying theory which allowed rational numbers, irrational numbers, geometrical magnitudes, etc., to all be treated as "algebraic objects". It gave mathematics a whole new development path so much broader in concept to that which had existed before, and provided a vehicle for future development of the subject. Another important aspect of the introduction of algebraic ideas was that it allowed mathematics to be applied to itself in a way which had not happened before. Al-Khwarizmi's text can be seen to be distinct not only from the Babylonian tablets, but also from Diophantus' Arithmetica. It no longer concerns a series of problems to be solved, but an exposition which starts with primitive terms in which the combinations must give all possible prototypes for equations, which henceforward explicitly constitute the true object of study. On the other hand, the idea of an equation for its own sake appears from the beginning and, one could say, in a generic manner, insofar as it does not simply emerge in the course of solving a problem, but is specifically called on to define an infinite class of problems. It is quite unlikely that al-Khwarizmi knew of the work of Diophantus, but he must have been familiar with at least the astronomical and computational portions of Brahmagupta; yet neither al-Khwarizmi nor other Arabic scholars made use of syncopation or of negative numbers. Nevertheless, the Al-jabr comes closer to the elementary algebra of today than the works of either Diophantus or Brahmagupta, because the book is not concerned with difficult problems in indeterminant analysis but with a straight forward and elementary exposition of the solution of equations, especially that of second degree. The Arabs in general loved a good clear argument from premise to conclusion, as well as systematic organization – respects in which neither Diophantus nor the Hindus excelled. Page from a Latin translation, beginning with "Dixit algorizmi"
Al-Khwārizmī's second major work was on the subject of arithmetic, which survived in a Latin translation but was lost in the original Arabic. The translation was most likely done in the 12th century by Adelard of Bath, who had also translated the astronomical tables in 1126. The Latin manuscripts are untitled, but are commonly referred to by the first two words with which they start: Dixit algorizmi ("So said"), or Algoritmi de numero Indorum ("al-Khwārizmī on the Hindu Art of Reckoning"), a name given to the work by Baldassarre Boncompagni in 1857. 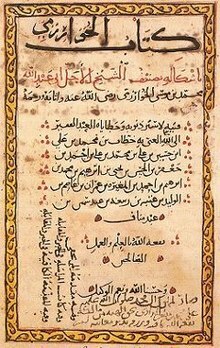 The original Arabic title was possibly Kitāb al-Jam‘ wat-Tafrīq bi-Ḥisāb al-Hind ("The Book of Addition and Subtraction According to the Hindu Calculation"). Al-Khwārizmī's work on arithmetic was responsible for introducing the Arabic numerals, based on the Hindu–Arabic numeral system developed in Indian mathematics, to the Western world. The term "algorithm" is derived from the algorism, the technique of performing arithmetic with Hindu-Arabic numerals developed by al-Khwārizmī. Both "algorithm" and "algorism" are derived from the Latinized forms of al-Khwārizmī's name, Algoritmi and Algorismi, respectively. Page from Corpus Christi College MS 283. A Latin translation of al-Khwārizmī's Zīj. Al-Khwārizmī's Zīj al-Sindhind (Arabic: زيج السند هند‎, "astronomical tables of Siddhanta") is a work consisting of approximately 37 chapters on calendrical and astronomical calculations and 116 tables with calendrical, astronomical and astrological data, as well as a table of sine values. This is the first of many Arabic Zijes based on the Indian astronomical methods known as the sindhind. The work contains tables for the movements of the sun, the moon and the five planets known at the time. This work marked the turning point in Islamic astronomy. Hitherto, Muslim astronomers had adopted a primarily research approach to the field, translating works of others and learning already discovered knowledge. The original Arabic version (written c. 820) is lost, but a version by the Spanish astronomer Maslamah Ibn Ahmad al-Majriti (c. 1000) has survived in a Latin translation, presumably by Adelard of Bath (January 26, 1126). The four surviving manuscripts of the Latin translation are kept at the Bibliothèque publique (Chartres), the Bibliothèque Mazarine (Paris), the Biblioteca Nacional (Madrid) and the Bodleian Library (Oxford). Al-Khwārizmī's Zīj al-Sindhind also contained tables for the trigonometric functions of sines and cosine. A related treatise on spherical trigonometry is also attributed to him. Al-Khwārizmī produced accurate sine and cosine tables, and the first table of tangents. Daunicht's reconstruction of the section of al-Khwārizmī's world map concerning the Indian Ocean. 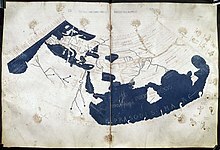 A 15th-century version of Ptolemy's Geography for comparison. Statue of Al-Khwārizmī in his birth town Khiva, Uzbekistan. Al-Khwārizmī's third major work is his Kitāb Ṣūrat al-Arḍ (Arabic: كتاب صورة الأرض‎, "Book of the Description of the Earth"), also known as his Geography, which was finished in 833. It is a major reworking of Ptolemy's 2nd-century Geography, consisting of a list of 2402 coordinates of cities and other geographical features following a general introduction. There is only one surviving copy of Kitāb Ṣūrat al-Arḍ, which is kept at the Strasbourg University Library. A Latin translation is kept at the Biblioteca Nacional de España in Madrid. The book opens with the list of latitudes and longitudes, in order of "weather zones", that is to say in blocks of latitudes and, in each weather zone, by order of longitude. As Paul Gallez[dubious – discuss] points out, this excellent system allows the deduction of many latitudes and longitudes where the only extant document is in such a bad condition as to make it practically illegible. Neither the Arabic copy nor the Latin translation include the map of the world itself; however, Hubert Daunicht was able to reconstruct the missing map from the list of coordinates. Daunicht read the latitudes and longitudes of the coastal points in the manuscript, or deduces them from the context where they were not legible. He transferred the points onto graph paper and connected them with straight lines, obtaining an approximation of the coastline as it was on the original map. He then does the same for the rivers and towns. Al-Khwārizmī corrected Ptolemy's gross overestimate for the length of the Mediterranean Sea from the Canary Islands to the eastern shores of the Mediterranean; Ptolemy overestimated it at 63 degrees of longitude, while al-Khwārizmī almost correctly estimated it at nearly 50 degrees of longitude. He "also depicted the Atlantic and Indian Oceans as open bodies of water, not land-locked seas as Ptolemy had done." Al-Khwārizmī's Prime Meridian at the Fortunate Isles was thus around 10° east of the line used by Marinus and Ptolemy. Most medieval Muslim gazetteers continued to use al-Khwārizmī's prime meridian. Al-Khwārizmī wrote several other works including a treatise on the Hebrew calendar, titled Risāla fi istikhrāj ta’rīkh al-yahūd (Arabic: رسالة في إستخراج تأريخ اليهود‎, "Extraction of the Jewish Era"). 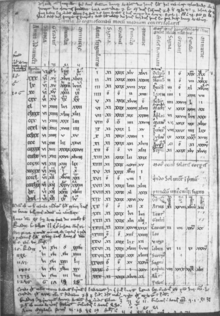 It describes the Metonic cycle, a 19-year intercalation cycle; the rules for determining on what day of the week the first day of the month Tishrei shall fall; calculates the interval between the Anno Mundi or Jewish year and the Seleucid era; and gives rules for determining the mean longitude of the sun and the moon using the Hebrew calendar. Similar material is found in the works of Abū Rayḥān al-Bīrūnī and Maimonides. Ibn al-Nadim's Kitāb al-Fihrist, an index of Arabic books, mentions al-Khwārizmī's Kitāb al-Taʾrīkh (Arabic: كتاب التأريخ‎), a book of annals. No direct manuscript survives; however, a copy had reached Nusaybin by the 11th century, where its metropolitan bishop, Mar Elyas bar Shinaya, found it. Elias's chronicle quotes it from "the death of the Prophet" through to 169 AH, at which point Elias's text itself hits a lacuna. Several Arabic manuscripts in Berlin, Istanbul, Tashkent, Cairo and Paris contain further material that surely or with some probability comes from al-Khwārizmī. The Istanbul manuscript contains a paper on sundials; the Fihrist credits al-Khwārizmī with Kitāb ar-Rukhāma(t) (Arabic: كتاب الرخامة‎). Other papers, such as one on the determination of the direction of Mecca, are on the spherical astronomy. Two texts deserve special interest on the morning width (Ma‘rifat sa‘at al-mashriq fī kull balad) and the determination of the azimuth from a height (Ma‘rifat al-samt min qibal al-irtifā‘). He also wrote two books on using and constructing astrolabes. Wikimedia Commons has media related to Muhammad ibn Musa al-Khwarizmi. Al-Khwarizmi (crater) — A crater on the far side of the moon named for al-Khwārizmī. Al-Khwarizmi Institute of Computer Science (KICS)- A Pakistani research institute named after al-Khwārizmī. ^ There is some confusion in the literature on whether al-Khwārizmī's full name is ابو عبد الله محمد بن موسى الخوارزمي‎ Abū ʿAbdallāh Muḥammad ibn Mūsā al-Khwārizmī or ابو جعفر محمد بن موسی الخوارزمی‎ Abū Ja‘far Muḥammad ibn Mūsā al-Khwārizmī. Ibn Khaldun notes in his encyclopedic work: "The first who wrote upon this branch [algebra] was Abu ‘Abdallah al-Khowarizmi, after whom came Abu Kamil Shoja‘ ibn Aslam." (MacGuckin de Slane). (Rosen 1831, pp. xi–xiii) mentions that "[Abu Abdallah Mohammed ben Musa] lived and wrote under the caliphate of Al Mamun, and must therefore be distinguished from Abu Jafar Mohammed ben Musa, likewise a mathematician and astronomer, who flourished under the Caliph Al Motaded (who reigned A.H. 279–289, A.D. 892–902)." In the introduction to his critical commentary on Robert of Chester's Latin translation of al-Khwārizmī's Algebra, L.C. Karpinski notes that Abū Ja‘far Muḥammad ibn Mūsā refers to the eldest of the Banū Mūsā brothers. Karpinski notes in his review on (Ruska 1917) that in (Ruska 1918): "Ruska here inadvertently speaks of the author as Abū Ga‘far M. b. M., instead of Abū Abdallah M. b. M."
^ Corbin, Henry (1998). The Voyage and the Messenger: Iran and Philosophy. North Atlantic Books. p. 44. ISBN 978-1-55643-269-9. ^ Saliba, George (September 1998). "Science and medicine". Iranian Studies. 31 (3–4): 681–690. doi:10.1080/00210869808701940. Take, for example, someone like Muhammad b. Musa al-Khwarizmi (fl. 850) who may present a problem for the EIr, for although he was obviously of Persian descent, he lived and worked in Baghdad and was not known to have produced a single scientific work in Persian. ^ a b Toomer 1990; Oaks, Jeffrey A. "Was al-Khwarizmi an applied algebraist?". University of Indianapolis. Archived from the original on 2010-11-15. Retrieved 2008-05-30. ; Hogendijk, Jan P. (1998). "al-Khwarzimi". Pythagoras. 38 (2): 4–5. ISSN 0033-4766. ^ a b Arndt, A. (1983). Al-Khwarizmi. The Mathematics Teacher, 76(9), 668–670. ^ Boyer, Carl B., 1985. A History of Mathematics, p. 252. Princeton University Press. "Diophantus sometimes is called the father of algebra, but this title more appropriately belongs to al-Khowarizmi..." , "...the Al-jabr comes closer to the elementay algebra of today than the works of either Diophantus or Brahmagupta..."
^ S Gandz, The sources of al-Khwarizmi's algebra, Osiris, i (1936), 263–277,"Al-Khwarizmi's algebra is regarded as the foundation and cornerstone of the sciences. In a sense, al-Khwarizmi is more entitled to be called "the father of algebra" than Diophantus because al-Khwarizmi is the first to teach algebra in an elementary form and for its own sake, Diophantus is primarily concerned with the theory of numbers." ^ Esposito, John L. (2000-04-06). The Oxford History of Islam. Oxford University Press. p. 188. ISBN 978-0-19-988041-6. Al-Khwarizmi is often considered the founder of algebra, and his name gave rise to the term algorithm. ^ Knuth, Donald (1979). Algorithms in Modern Mathematics and Computer Science (PDF). Springer-Verlag. ISBN 978-0-387-11157-5. Archived from the original (PDF) on 2006-11-07. ^ Philip Khuri Hitti (2002). History of the Arabs. p. 379. ISBN 978-1-137-03982-8. ^ "Islam Spain and the history of technology". www.sjsu.edu. Retrieved 2018-01-24. ^ L., V.D. (1985). A history of algebra: from al – Khwarizmi to emmy noether. Berlin: Springer-Verlag. ^ Cristopher Moore and Stephan Mertens, The Nature of Computation, (Oxford University Press, 2011), 36. ^ Rashed, Roshdi (1988). "al-Khwārizmī's Concept of Algebra". In Zurayq, Qusṭanṭīn; Atiyeh, George Nicholas; Oweiss, Ibrahim M. (eds.). Arab Civilization: Challenges and Responses : Studies in Honor of Constantine K. Zurayk. SUNY Press. p. 108. ISBN 978-0-88706-698-6. ^ "al-Khwarizmi". Encyclopædia Britannica. Retrieved 2008-05-30. ^ a b Rosen, Frederic. "The Compendious Book on Calculation by Completion and Balancing, al-Khwārizmī". 1831 English Translation. Retrieved 2009-09-14. ^ Karpinski, L.C. (1912). "History of Mathematics in the Recent Edition of the Encyclopædia Britannica". American Association for the Advancement of Science. 35 (888): 29–31. Bibcode:1912Sci....35...29K. doi:10.1126/science.35.888.29. PMID 17752897. ^ Boyer, Carl B. (1991). "The Arabic Hegemony". A History of Mathematics (Second ed.). John Wiley & Sons, Inc. p. 228. ISBN 978-0-471-54397-8. The Arabs in general loved a good clear argument from premise to conclusion, as well as systematic organization — respects in which neither Diophantus nor the Hindus excelled. ^ (Boyer 1991, "The Arabic Hegemony" p. 229) "It is not certain just what the terms al-jabr and muqabalah mean, but the usual interpretation is similar to that implied in the translation above. The word al-jabr presumably meant something like "restoration" or "completion" and seems to refer to the transposition of subtracted terms to the other side of an equation; the word muqabalah is said to refer to "reduction" or "balancing" — that is, the cancellation of like terms on opposite sides of the equation." ^ a b O'Connor, John J.; Robertson, Edmund F., "Muhammad ibn Musa al-Khwarizmi", MacTutor History of Mathematics archive, University of St Andrews . ^ Florian Cajori (1919). A History of Mathematics. Macmillan. p. 103. That it came from Indian source is impossible, for Hindus had no rules like "restoration" and "reduction" .They were never in the habit of making all terms in an equation positive, as is done in the process of "restoration. ^ Carl Benjamin Boyer (1968). A History of Mathematics. p. 252. ^ Jacques Sesiano, "Islamic mathematics", p. 157, in Selin, Helaine; D'Ambrosio, Ubiratan, eds. (2000). Mathematics Across Cultures: The History of Non-western Mathematics. Springer Science+Business Media. ISBN 978-1-4020-0260-1. ^ The full title is "The Book of the Description of the Earth, with its Cities, Mountains, Seas, All the Islands and the Rivers, written by Abu Ja'far Muhammad ibn Musa al-Khwārizmī, according to the Geographical Treatise written by Ptolemy the Claudian", although due to ambiguity in the word surah it could also be understood as meaning "The Book of the Image of the Earth" or even "The Book of the Map of the World". ^ "The history of cartography". GAP computer algebra system. Archived from the original on 2008-05-24. Retrieved 2008-05-30. ^ Covington, Richard (2007). "The Third Dimension". Saudi Aramco World, May–June 2007: 17–21. Archived from the original on 2008-05-12. Retrieved 2008-07-06. ^ LJ Delaporte (1910). Chronographie de Mar Elie bar Sinaya. Paris. p. xiii. Toomer, Gerald (1990). "Al-Khwārizmī, Abu Ja'far Muḥammad ibn Mūsā". In Gillispie, Charles Coulston (ed.). Dictionary of Scientific Biography. 7. New York: Charles Scribner's Sons. ISBN 978-0-684-16962-0. Dunlop, Douglas Morton (1943). "Muḥammad b. Mūsā al-Khwārizmī". The Journal of the Royal Asiatic Society of Great Britain and Ireland (2): 248–250. JSTOR 25221920. Hogendijk, Jan P., Muhammad ibn Musa (Al-)Khwarizmi (c. 780–850 CE) – bibliography of his works, manuscripts, editions and translations. O'Connor, John J.; Robertson, Edmund F., "Abu Ja'far Muhammad ibn Musa Al-Khwarizmi", MacTutor History of Mathematics archive, University of St Andrews . Fuat Sezgin. Geschichte des arabischen Schrifttums. 1974, E.J. Brill, Leiden, the Netherlands. Sezgin, F., ed., Islamic Mathematics and Astronomy, Frankfurt: Institut für Geschichte der arabisch-islamischen Wissenschaften, 1997–99. Gandz, Solomon (November 1926). "The Origin of the Term "Algebra"". The American Mathematical Monthly. 33 (9): 437–440. doi:10.2307/2299605. ISSN 0002-9890. JSTOR 2299605. Gandz, Solomon (1936). "The Sources of al-Khowārizmī's Algebra". Osiris. 1 (1): 263–277. doi:10.1086/368426. ISSN 0369-7827. JSTOR 301610. Gandz, Solomon (1938). "The Algebra of Inheritance: A Rehabilitation of Al-Khuwārizmī". Osiris. 5 (5): 319–391. doi:10.1086/368492. ISSN 0369-7827. JSTOR 301569. Hughes, Barnabas (1986). "Gerard of Cremona's Translation of al-Khwārizmī's al-Jabr: A Critical Edition". Mediaeval Studies. 48: 211–263. Barnabas Hughes. Robert of Chester's Latin translation of al-Khwarizmi's al-Jabr: A new critical edition. In Latin. F. Steiner Verlag Wiesbaden (1989). ISBN 3-515-04589-9. Karpinski, L.C. (1915). Robert of Chester's Latin Translation of the Algebra of Al-Khowarizmi: With an Introduction, Critical Notes and an English Version. The Macmillan Company. Ruska, Julius (1917). "Zur ältesten arabischen Algebra und Rechenkunst". Sitzungsberichte der Heidelberger Akademie der Wissenschaften, Philosophisch-historische Klasse. Sitzungsberichte der Heidelberger Akademie der Wissenschaften. Philologisch-historische Klasse. Jahr. 1917,2. Abh: 1–125. Folkerts, Menso (1997). Die älteste lateinische Schrift über das indische Rechnen nach al-Ḫwārizmī (in German and Latin). München: Bayerische Akademie der Wissenschaften. ISBN 978-3-7696-0108-4. Goldstein, B.R. (1968). Commentary on the Astronomical Tables of Al-Khwarizmi: By Ibn Al-Muthanna. Yale University Press. ISBN 978-0-300-00498-4. Hogendijk, Jan P. (1991). "Al-Khwārizmī's Table of the "Sine of the Hours" and the Underlying Sine Table". 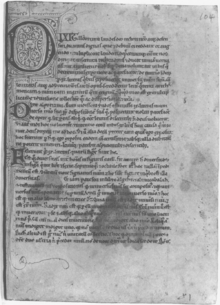 Historia Scientiarum. 42: 1–12. Rosenfeld, Boris A. (1993). Menso Folkerts; J.P. Hogendijk (eds.). "Geometric trigonometry" in treatises of al-Khwārizmī, al-Māhānī and Ibn al-Haytham. Vestiga Mathematica: Studies in Medieval and Early Modern Mathematics in Honour of H.L.L. Busard. Amsterdam: Rodopi. ISBN 978-90-5183-536-6. Suter, Heinrich. [Ed. ]: Die astronomischen Tafeln des Muhammed ibn Mûsâ al-Khwârizmî in der Bearbeitung des Maslama ibn Ahmed al-Madjrîtî und der latein. Übersetzung des Athelhard von Bath auf Grund der Vorarbeiten von A. Bjørnbo und R. Besthorn in Kopenhagen. Hrsg. und komm. Kopenhagen 1914. 288 pp. Repr. 1997 (Islamic Mathematics and Astronomy. 7). ISBN 3-8298-4008-X. B.A. Rozenfeld. "Al-Khwarizmi's spherical trigonometry" (Russian), Istor.-Mat. Issled. 32–33 (1990), 325–339. Kennedy, E. S. (1964). "Al-Khwārizmī on the Jewish Calendar". Scripta Mathematica. 27: 55–59. Daunicht, Hubert (1968–1970). Der Osten nach der Erdkarte al-Ḫuwārizmīs : Beiträge zur historischen Geographie und Geschichte Asiens (in German). Bonner orientalistische Studien. N.S. ; Bd. 19. LCCN 71468286. Mžik, Hans von (1915). "Ptolemaeus und die Karten der arabischen Geographen". Mitteil. D. K. K. Geogr. Ges. In Wien. 58: 152. Mžik, Hans von (1916). "Afrika nach der arabischen Bearbeitung der γεωγραφικὴ ὑφήγησις des Cl. Ptolomeaus von Muh. ibn Mūsa al-Hwarizmi". Denkschriften D. Akad. D. Wissen. In Wien, Phil.-hist. Kl. 59. Mžik, Hans von (1926). Das Kitāb Ṣūrat al-Arḍ des Abū Ǧa'far Muḥammad ibn Mūsā al-Ḫuwārizmī. Leipzig. Ruska, Julius (1918). "Neue Bausteine zur Geschichte der arabischen Geographie". Geographische Zeitschrift. 24: 77–81. Spitta, W. (1879). "Ḫuwārizmī's Auszug aus der Geographie des Ptolomaeus". Zeitschrift Deutschen Morgenl. Gesell. 33. For a more extensive bibliography, see History of mathematics, Mathematics in medieval Islam, and Astronomy in medieval Islam. Boyer, Carl B. (1991). "The Arabic Hegemony". A History of Mathematics (Second ed.). John Wiley & Sons, Inc. ISBN 978-0-471-54397-8. Dallal, Ahmad (1999). "Science, Medicine and Technology". In Esposito, John (ed.). The Oxford History of Islam. Oxford University Press, New York. King, David A. (1999a). "Islamic Astronomy". In Walker, Christopher (ed.). Astronomy before the telescope. British Museum Press. pp. 143–174. ISBN 978-0-7141-2733-0. King, David A. (2002). "A Vetustissimus Arabic Text on the Quadrans Vetus". Journal for the History of Astronomy. 33 (112): 237–255. Bibcode:2002JHA....33..237K. doi:10.1177/002182860203300302. Struik, Dirk Jan (1987). A Concise History of Mathematics (4th ed.). Dover Publications. ISBN 978-0-486-60255-4. O'Connor, John J.; Robertson, Edmund F., "Abraham bar Hiyya Ha-Nasi", MacTutor History of Mathematics archive, University of St Andrews .